My first enchantress is F1E1N1, which means that without boosters she can forge fire brands and rings of fire resist and dragon helms and probably some other things. Not a bad start, but she won't be able to do any remote site searching for fire sites so my fire income will remain low for a while. I have her move to the fort in Worshin so that she can research in safety. Technically I could have her site search manually but my research is terribly far behind and I plan to use any 2-rank enchantresses for remote searching as I get them. With that in mind, I recruit another. My remote searches turned up a couple of gem income sites, nothing special. It's nice to have those efforts bear fruit so quickly. Random events provide a few extra fire and nature gems, and I watch a couple of Hinnom/Lanka battles. My blood hunting and sacrificing efforts are working out well enough, and I've spotted Lilli's "secret weapon" on or near one of my borders. This new unit is not tremendously surprising to see but a little bit alarming nevertheless. Perhaps the most important aspect of this turn is that Feinne and I have been talking about my intent to attack Pangaea. Based on these conversations (and little else, since my scouts in Panic territory keep getting caught) I have gathered that the conflict between Feinne and iod seems to be tipping somewhat in iod's favor. I don't think that it has become one-sided or anything so I won't be foolishly attacking Pangaea just when he's looking for a fresh opponent anyway. However I have only one province from which to attak iod quickly. From there I can attack only one of iod's provinces, and it has a fort on it. If I want to take the time to reposition my army so that I can attack any of several provinces then iod will have at least one turn to respond to my obvious war preparations. It's not a great situation but I feel that I have to cut off that blood sacrifice, and I've got to keep expanding in order to keep up with the other powers anyway. 4. Extract blood price from Arcoscephale (408 gold). Ah, turn 41. For me, this was the beginning of what I think of as the "Shenanigans" phase of this game. There were a few in-game messages, a gift, a research goal achieved, and a slew of typical turn happenings. Also there's a major diplomatic event that I may be the first to discuss, how exciting! Let's go down the list. This global message suggests that the Mictlan/Arcoscephale war is not going well for Dexanth, but also that the situations isn't completely hopeless. If Dexanth thinks he can spend his way out of trouble then all is not lost. I am not imaginative enough to think of any items I want to trade for that I can't get from Hinnom at a better rate. Therefore this message is somewhat informative but otherwise useless. This generous gift is Hinnom's way of keeping me from collapsing in the face of dominion push. I am of course grateful for the assistance and immediately make plans to sacrifice every single slave. My dominion growth last turn was a good start and every little bit helps. I reached Conjuration 6. I know that I'm not the first one to do so because--as I already mentioned--Dexanth has Shishis. It doesn't d much for me except allow me to summon Ghosts and Spectral Mages. Neither of thos things is bad, actually. I've actually summoned some more Shades to send with a Witch King into the water south of the isthmus, for example. If I'd waited another turn then I could have summoned the much more powerful Ghosts instead. Even so I am staying the course and continuing to put all of my research into Conjuration. At the next level I unlock Wrath of the Ancestors, which is kind of a bigger and better version of Raise Skeletons that requires a gem and can only be cast by T'ien Ch'i and Sauromatia. That's not my true goal, either, and I fully intend to continue to Conjuration 8. At Conjuration 8 I will unlock the "Elemental Royalty" summons, which are powerful and unique elemental commanders that require more elemental paths than anybody in my nation has, excepting my dead goddess. It also unlocks Earth Attack, which is a really handy remote assassination spell that nobody but my dead goddess can cast, so oh well. I don't plan on stopping at Conjuration 8 either, even though it's pretty great. No, I will be continuing to Conjuration 9 so that I can realize Project X. There are several awesome things at Conjuration 9 but all I care about is a national spell unique to Sauromatia and Pythium: Daughter of Typhon. In vanilla Dominions 3 I don't think she's necessarily worth all of the trouble it takes to get her. In Awesome Endgame she's prety fantastic, assuming you cast Gift of Reason on her to make her a commander. I've mentioned that I don't see myself as a world power; I don't see myself as a contender for victory, either. At this stage of the game is seems to me that Mictlan, Hinnom, or maybe Pangaea will ultimately win it. That being said, this game is entertaining and I'm going to do whatever I can to maximize my own enjoyment and that of the readers of this LP. To that end I have defined Project X as "Summon Daughter of Typhon and then Gift of Reason her." Hopefully once I've got her in hand I can put her to work doing some very silly things. Finally, let's discuss that diplomatic activity I mentioned earlier. It turns out that Dexanth's attempts to put together an anti-Lilli coalition did not create much direct support for his cause, but it did create concern among some of us. buildscharacter, iod, and myself talked quite a bit at this point. iod agreed to ease up on blood sacrificing, which was a requirement for the defensive pact we formed. The terms of the defensive pact were that if any of us is attacked (we assumed by Mictlan) then all of us will respond. The leaves each of us with only a handful of targets, since we aren't going to be attacking fellow pact members. In the short term we agree that buildscharacter still has his hands full with Lanka, but I can satisfy my need to expand by helping iod destroy T'ien Ch'i. Given that my armies were headed in that direction to attack iod, this is an easy logistic shift to make. Because I don't have any lands directly bordering TC, iod is going to grant me a pair of provinces that will provide me with access. I figure that Feinne should assume that my expansion into Pangaean territory is actually the offensive that I told him I wanted to make during the previous turn. I don't have any intention of clarifying that point unless he asks me very directly about it. The good news here of course is that I've secured two provinces without a fight, and a reasonable assumption for the element of surprise afterwards. I'm also planning to expand further underwater--including into a province that Lilli took from Dexanth and had agree to let me have during an earlier turns' diplomatic maneuverings. It's worth pointing out that when Dexanth flat out refused to let me use the water provinces in exchange for my assistance against Lilli, I then went to Lilli and told her that Dexanth was asking me to attack her. I asked her if it would be alright if I took the water provinces from Dexanth (or from her, if she happened to have grabbed one while fighting him). Underwater provinces generally have lower income and--without a sort of soft exploit--cannot be blood hunted. They tend to have worse magic sites, and for almost every land nation they cannot host any province defense either. On top of all of that it usually takes gems (via summons and/or gear) to even get into the water in the first place. In short the underwater are not nearly as valuable as land provinces and for somebody like Lilli it's probably not a big deal to let me have them if it means that I might shore up a border against Dexanth. Besides, if she wants them later she should have no problem taking them back from me. That being said, this deal should result in relatively easily won provinces for me, and I fully intend to make the ocean work for me. Things are looking up! 4. Extract blood price from Arcoscephale (474 gold). Those two turns ended up taking more time than I anticipated. I'll try to post a couple more over the weekend, but I make no guarantees. 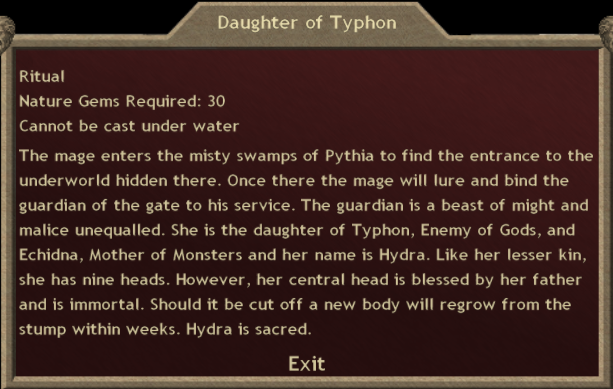 Edit: Very belatedly, I realize that I attributed Daughter of Typhon's improvements to Awesome Gods when in act the correct mod is Awesome Endgame. I've corrected that error.